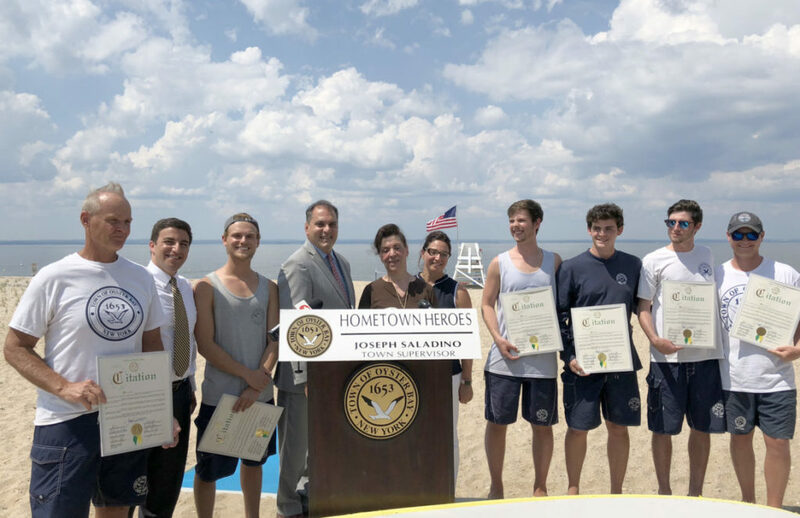 Oyster Bay Town Supervisor Joseph Saladino and Councilmembers Louis Imbroto and Michele Johnson reunited the heroic members of the town’s lifeguard crew with a near-drowning victim who was discovered unresponsive in the waters of Stehli Beach on the July 4th holiday. The Town’s six lifeguards collectively entered into emergency response mode when the victim was observed. The woman, Anna Zapantis of Locust Valley, was unresponsive. She was immediately taken from the water and successfully resuscitated and transported to the local hospital for evaluation.